May Paper Pumpkin Deadline and 24 HOUR FLASH SALE! URGENT: NEW* Paper Pumpkin Subscribers can get the MAY 2015 Paper Pumpkin Kit delivered to your door for ONLY $5!!! (regularly $19.95) Enter Promo Code 24HOURS, along with valid payment and delivery information, to take advantage of this offer. Offer valid ONLY through Saturday, May 9th, 2015 at 6:50pm MT. 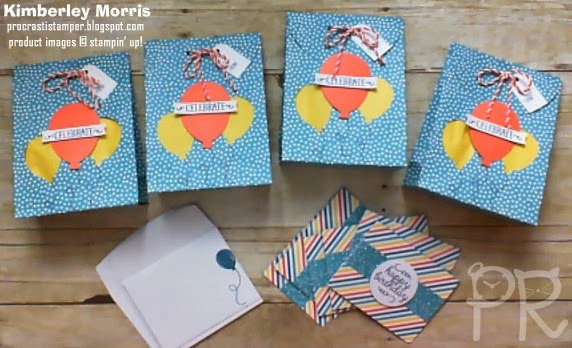 Normally the contents of the kit are a surprise, but we got a little Sneak Peek of the May kit...it contains 4 Gift Bags + 6 Cards & Envelopes, as well as the embellishments, stamps, and ink, to complete the projects. The picture below is a snapshot from a live video you can watch HERE, showing the projects as designed for the kit, PLUS some adorable alternate ideas. The stamps in the kit include a birthday greeting, as well as a generic 'Celebrate' greeting, which would be ideal for upcoming graduations! CLICK HERE TO SIGN UP FOR PAPER PUMPKIN WITH ME! Now that I've told you about this fabulous deal, let me explain that there is NO obligation with a Paper Pumpkin subscription. That means, you can take advantage of this $5 deal, and what you choose after that is TOTALLY up to you! You can Skip unlimited months on a subscription, or Cancel at any time. The only caveat is that you need to make sure you enter any changes for a given month, prior to the deadline of the 10th by 11:59pm MT, for them to take effect that month. As a Paper Pumpkin subscriber, you also have the privilege of purchasing Past Kits and Past Kit Refills. These are made available as stock allows, and while supplies last. Past Kits are entire kits, including stamps, ink, and all the consumables. Past Kit Refills include only the consumables. The only way to GUARANTEE you get multiples of a kit, is to add the quantity onto your monthly subscription. The subscription kits will ALL be full kits, with stamp, ink, and consumables. If you only want the consumables, you'll have to wait until the Past Kit Refills become available (*if* they do become available), and try to place your order to get yours before they run out. I'm explaining this in detail, specifically because the Sneak Peek for May's kit has created a lot of excitement, which makes me think that refills for this kit are likely to run out FAST! As long as I'm in the mode of belated sharing, there are some cards from the holidays that I'd like to post. This one uses several products which are retiring for good after June 2nd, so if you click the link(s) and the product page does not show up, or search my Online Store and cannot find it, the item(s) may be sold out already. So sorry! I made something like 24 different cards for last year's Christmas card classes, and so many of them are my "favorite" card...but if I had to pick just one card overall, it would be this one. There is such a simple elegance to the layout and color scheme, it seems universally pleasing. It features the Northern Flurry Embossing Folder (retiring) for texture, and the simple script of the Christmas greeting from the Petite Pairs stamp set (retiring, available in wood-mount or clear-mount). Stampin' Supplies: Petite Pairs stamp set, Northern Flurry Embossing Folder (used with the Big Shot), Very Vanilla card stock, Soft Sky card stock, Crumb Cake card stock, Soft Sky Seam Binding Ribbon (retiring), Baked Brown Sugar ink pad (retiring - SOLD OUT; consider subbing Chocolate Chip or Early Espresso), Basic Pearls. I know this is running about a month behind...but, better late than never, right? This sweet little chick made the perfect greeting card for my college kids' care packages. 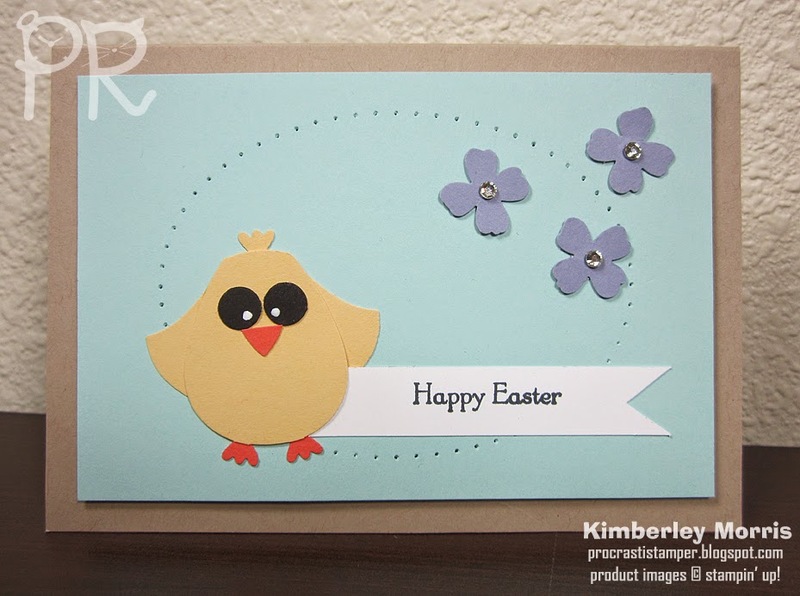 This is yet another design idea I stole borrowed from Stampin' Connection, which is an exclusive free forum for sharing ideas that you can access once you Become a Demonstrator! This card features the Owl Builder Punch. I trimmed the ear tufts off the top corners of the punched body, for the main piece. I also cut the feet from the body and punched another body out in orange, then stuck those orange feet behind the body shape. I saved one of the little yellow feet I cut off, to use as the feather tuft atop the chick's head. For the wings, I used the "vest" shape from the punch, and cut that in half. Then I tucked a half of the vest under each side of the body. For the nose/beak, I punched out the heart shape, but trimmed the top flat. The eyes were punched from black, but instead of trying to glue tiny white dots onto that, I simply used the White Gel Pen to mark them in place. ALTERNATE IDEA: I think you could use this card for a new baby by making the chick into a duck. All you need to do is round the end of the beak, and then make the feet triangles (by trimming off the top of the heart shape from the punched image). You might want to slide the wings down a little bit, too. Stampin' Supplies: Teeny Tiny Wishes stamp set (I recommend wood-mount, but it also comes in clear-mount), Kraft Notecards & Envelopes, Soft Sky card stock, So Saffron card stock, Wisteria Wonder card stock, Calypso Coral card stock, Basic Black card stock, Whisper White card stock, Memento Tuxedo Black ink pad, White Gel Pen, Piercing Tool, Stampin' Pierce Mat, Essentials Paper Piercing Pack, Basic Rhinestones, Owl Builder Punch, Itty Bitty Punch Pack (flower shape). Click on Image to SHOP NOW!!! Click Image Above for my Customer Newsletter Signup Form! Click the image above to Become a Demonstrator and Join My Team! Please respect the time and effort put into the creation of this blog and the stamping ideas therein, by refraining from copyright abuse of the images or text. All of the rubber stamp images are copyrighted to Stampin' Up!®, all of the photos and scans are copyrighted to me, and all of the hand stamped art is my creation, unless marked otherwise. Please do not pass off this work as your own, or copy and disseminate it for your own personal gain, such as submission for contests or publication, or fee-based classes. If you would like to share a post from my blog, please email your friends a link directly to the post you're excited about. (You can do this by clicking the envelope icon under any post.) And last but not least, if you have any questions or suggestions, please don't hesitate to contact me!